OLYMPIA — Five years ago, Lynnwood lawmaker Marko Liias began an effort in the Legislature to stop licensed therapists from trying to change a young person’s sexual orientation or gender identity. His proposal for a work group to examine and potentially regulate those trafficking in disproved practices of converting gay and transgender patients didn’t get a hearing. He didn’t end his pursuit. On Wednesday, the Democratic state senator beamed as he watched Gov. Jay Inslee sign into law his bill banning conversion therapy and making licensed health care providers subject to punishment if they employ such practices on anyone younger than 18. Spotlighting the dangers of the practice should deter parents from considering it for their children, Liias said. Inslee, in a news conference before the signing of Senate Bill 5722, said conversion therapy is abuse. “It is inhumane and not acceptable in the state of Washington,” he said. Chad Griffin, president of the Human Rights Campaign, said there is no credible evidence conversion therapy can change a person’s sexual orientation or gender identity or expression. Rather, he said, it can pose devastating health risks for LGBTQ young people, such as depression, decreased self-esteem, substance abuse, homelessness and even suicidal behavior. Conversion therapy is an umbrella term for a wide array of approaches that typically involve encouraging people to change or conceal who they are, convincing them that their sexual orientation or gender expression is a source of shame or danger. The American Psychiatric Association, American Psychological Association, and American Medical Association are among the organizations that have decried the practice. The new state law defines conversion therapy as any effort to change a person’s sexual orientation or gender identity using psychological or spiritual interventions. Licensed health care providers who employ such practices on youths younger than 18 could be cited for unprofessional conduct and sanctioned with fines, license revocation or suspension. It’s not known how many people in Washington migh be practicing conversion therapy on young people. Supporters of the bill pledged to look for and file complaints on those they can find. The law does not apply to churches or individual clergy, unless the person is also a licensed health care provider. In 2013 Liias, then a state representative, authored a bill to have the state Department of Health convene a work group to examine and potentially regulate efforts of licensed and unlicensed health care providers to change the sexual orientation of patients younger than 18. In 2015, his bill prohibiting the use of “aversive therapy” was passed unanimously in the Republican-controlled Senate. But the Democrat majority in the House made changes and when it came back to the Senate, the GOP declined to vote on the revised version. The bill signed into law Wednesday was introduced in 2017 but didn’t get a hearing. With Senate Democrats in the majority in 2018, it moved through quickly. Along the way, Liias said one of the notable moments in the legislative process came a couple of years ago with the political conversion of Rep. Richard DeBolt, R-Chehalis, from an opponent to a staunch supporter. Last month, when the state House debated and passed the Senate bill for the final time, DeBolt spoke on the floor about what changed his mind. He said he was naive about the practice until hearing a young man testify of the therapies he endured. Senate Bill 5722 wound up passing by margins of 66-32 in the House and 33-16 in the Senate. When it takes effect in June, Washington will join Oregon, California, Connecticut, Nevada, New Jersey, Illinois, Vermont, New York, New Mexico, Rhode Island and the District of Columbia, which have laws or regulations banning the use of such therapies on youth, according to the Human Rights Campaign. Jerry Cornfield: 360-352-8623; jcornfield@herald net.com. Twitter: @dospueblos. Hannah Patterson has made a career out of helping children. She’s doing the same thing in retirement. Colton Harris-Moore says travel restrictions are holding back a lucrative public-speaking career. Federal law allows a switch to permanent standard time, but the reverse requires congressional approval. Tuesday’s election also looked favorable for Marysville’s fire measure, but not Monroe’s hospital levy. An Everett man, 27, was charged in a January 2018 robbery involving a fake bomb near Martha Lake. A habitat restoration effort on Little Bear Creek aims to offset damage from future road projects. Snohomish County has teamed up with the conservation group Forterra on the Healthy Forests Project. The cause of the fire in Everett’s Edgewater neighborhood near Mukilteo was under investigation. 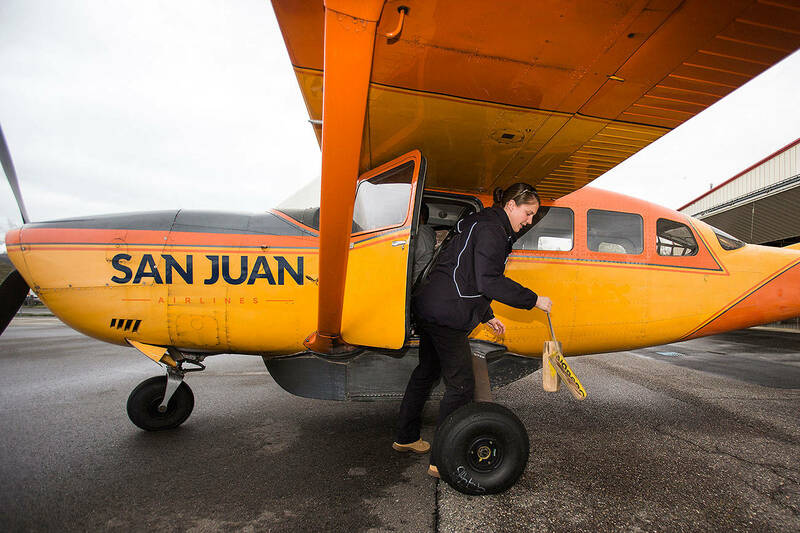 San Juan Airlines begins scheduled passenger service from Everett to Friday Harbor on May 1. An Everett man, 25, was arrested. He’s also suspected of trying to stab a woman who happened by. The wild pursuit went from Everett to Edmonds. A passenger was tied to a homicide near Yakima. A judge handed down a 35-year sentence to Hassani Hassani for the murder of Ezekiel Kelly of Everett.